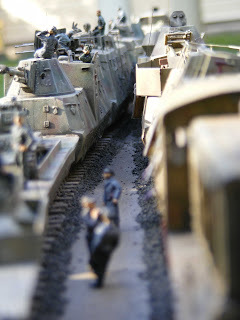 These BP-44 Armoured Train Wagons, have done a lot of work to improve them, and add I have added basic interior floors and walls, opened up numerous hatches and doors, made wire rungs and handles, and scratch built new cannons, obtained an etch Wirbelwind turret and brass barrels for the Flak gun, though I won't go into the details of what I did (unless anyone wants me too). I have a basic paint job on all three wagons, though I will tone down the Kommandowagen a bit, the green and red brown is too bright at this stage, and the Wirbelwind Flakwagen camouflage may get more work yet. Update 05 September 2012. After looking at the paint job on these wagons, I decided that I wanted them to look a bit more similar, so have reapplied a paint job to all of the above wagons. They still need a wash, and I think a light coat of yellow to mute the colours a bit more. Update 09 September 2012. I still wasn't happy with the paint job on these wagons, so have done them again. Same paints as before, but totally different paint scheme. I wanted what I hope looks like a late war paint job, given the train is meant to be late war. Many different paint schemes were seen on these trains. Update 12 September 2012. I was pretty happy with the paint job, but decided it was a bit too indistinct, so have used the same 3 colours as already used to make a slightly darker and more defined (but still very soft edged) paint scheme. To my knowledge the only colour pictures of BP-42/44 wagons were taken in late 1942 or early 1943, when the base coat was dark grey (same as the rest of the Wehrmacht) and the colour pictures also show winter whitewash over the dark grey. These were probably taken when the first six BP-42s were completed in late 1942 and were newsworthy enough to warrant some colour propaganda photographs and a story for the print media. When the Wehrmacht changed to dark yellow, armoured trains also seem to have been painted dark yellow, often with other colours sprayed over in various patterns. The new paint scheme I've done is similar to what is seen on some black and white photos, though what actual shades were sprayed on is anybody's guess, as none of the pictures from the war are in colour. 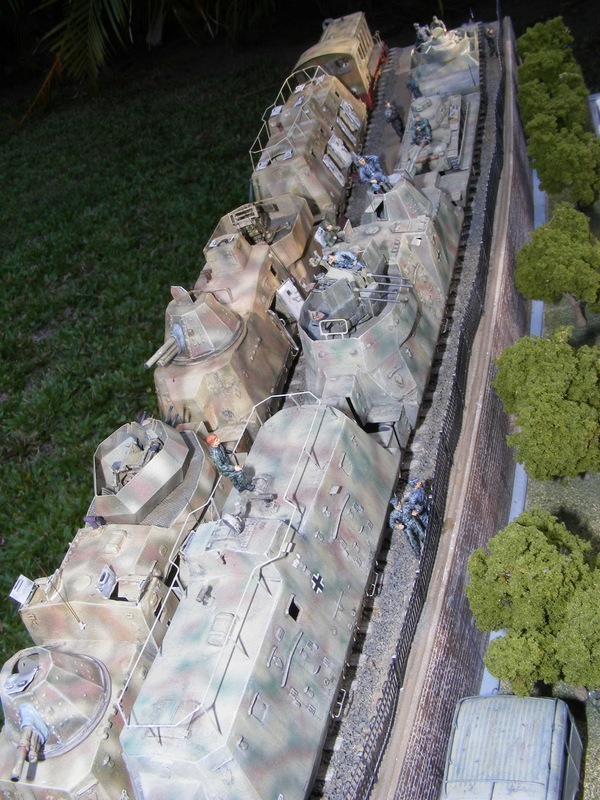 As these trains were attached to Army Groups and conformed with the same base coats as applied to the army, it seems likely that red brown and green would have been commonly used as camouflage colours. Black and white period photos indicate at least two differing colours applied in a wide variety of patterns over a base coat. Update 23 October 2012. Some work has been done on the Flak Wagen. It has had a wash of Burnt Umber artists oil paint diluted in thinners. Decals have been applied, and another light wash of Citadel Devlan Mud has been applied. All angled edges have been high lighted with a light brushing of Lifecolor acrylic Dunkelgelb. I have made exit doors for the sides from plastic card, wire and stretched sprue for the door unlocking handles. Interior door detail was based on period photos showing the doors in the opened position. Next job is to make the top observation hatches. Update 27 October 2012. I have now made and fitted all doors and hatch covers on this wagon. An aerial mount was made from stretched sprue and evergreen strip. Aerial itself is a bristle from a large paintbrush. Next job is finish the other flak wagon with the 37mm AA gun. Update 18 December 2012. Its been a few weeks since the last update on the BP-44 build. I was working on some other builds as well as advancing this one, bit by bit. I now have the Kommandowagen mostly finished. I made the side doors from plastic card, to match period photos of these open doors. The inside door handles are made from stretched sprue. The hand rails on each side of each door opening are also stretched sprue. Grab handles inside each door are made from bent staples. Similar with the roof hatch doors. The lower chassis locking handles are made from stretched sprue. The large frame antenna was made from wire. Ideally one piece would have been nice, but very difficult to do, so I made the two sides and ends separately and attached them. The aerial mounting poles are made from the same wire, these were carefully mounted in the exact needed positions, angles and heights during the construction stage. The ventilator outlets were made from plastic rod. Next job is to paint all these open doors, period photos indicate they were a much lighter colour than the outside of the wagon, its a reasonable assumption they were painted the same off white colour as the interior of armoured vehicles, and that the lower chassis access hatches might be red primer on the inside. Update 19 December. A few practice pictures. I have to compliment you on your BP 44 builds, I am just in the process of starting mine, the Mach2 effort :-/. needs a lot of TLC!!! any idea where euro chain links and hooks can be purchased ?? sorry about the slow reply, have been indisposed for some time. it is possible to make the BP-44 a worker, if you put the time into it. Re working links. I have found two model railway types that are more or less close enough to the real thing. There may be better out there, I'd be glad to know, if anyone knows of other choices. Getting actual 1/72 scale is unlikely, I think HO or OO is close enough, particularly given the couplings are hidden by armoured skirts and a walkway plate, when joined up. What I have obtained is from Austral Model Craft, a model railway shop in Mt Gravavtt (south side of Brisbane). Both types are made by Romford Models. You can probably get them cheaper online. The first is more expensive ($15.95), contains hooks links and screw couplings that can actually be wound tighter, like the real thing. The second has just the hooks and links, and was about half the price of the first (lost the price tag.